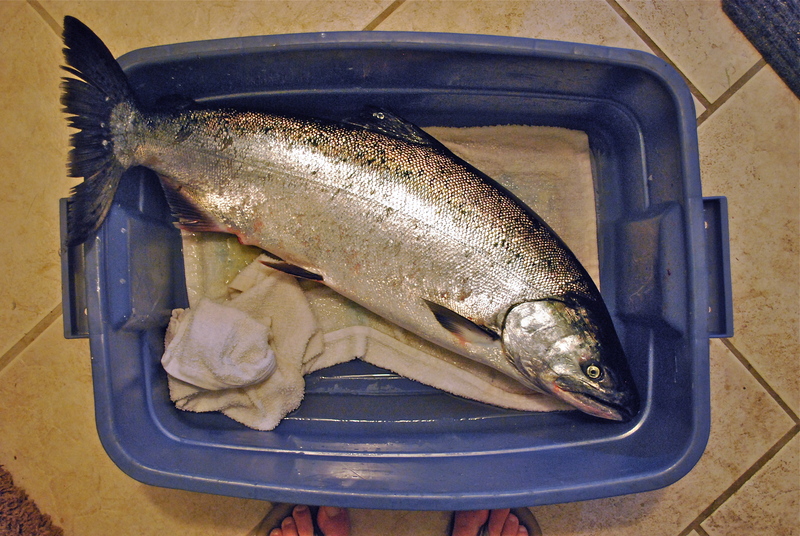 Today after a long day of work I was surprised with a most wonderful gift, a huge Chinook salmon, freshly caught for me by my very talented boyfriend. We don’t have a scale, but he seemed to us both to be about 17 pounds. He has now been cleaned and dressed, and shares shelf space in the fridge with fresh Red Rock and Dungeness crab, spot prawns and tiger prawns, and beautiful rock cod and kelp greenling filets, all caught by the two of us in the past two days. I plan to use the salmon, crab and prawns to make a copycat Costco stuffed salmon. If it works we will be eating a lot of them, I can promise you. Tomorrow we have a full, fun day of fishing planned and I will be collecting some sea asparagus at the marina as a side dish. The poultry may get to try some if there’s any left over. They’ve been very happy to clean up all the fish heads and guts for us in the meantime. Here’s hoping for calm seas! This entry was posted in cooking, fish and tagged chinook salmon, cooking, fishing. Bookmark the permalink.